Character Development – How do they approach the holidays? When we think about Holidays, we’re usually only considering the setting for events and atmosphere. Often neglecting how the holidays in general, or even specific ones might affect the moods, feelings, and opinions of the characters involved. 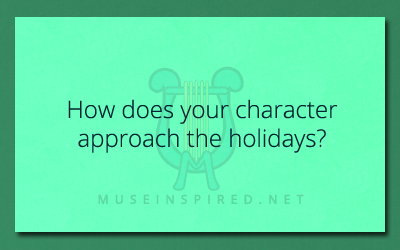 In this exercise, detail out how your character feels about holidays. How do they approach them or think about them? How do they feel about their BIRTHDAY? Do they tell people about it? Do they like parties? Hate it? Ignore it? How do they behave when it’s someone else’s birthday? Do they have a religion where they celebrate certain holidays and not others? Christmas vs Hanukkah? Pagan rituals? No holidays at all? Do they have a favorite holiday? Why do they like it so much? Do they HATE any specific holidays? Did something happen on that day, or do they have other reasons? Do they get in to the spirit of holidays? Do they like having parties for them? Do they spend time with family or friends on holidays? List how specific holidays and how that character deals with them! Character Development - What is your character's New Year Resolution? Character Development - What does your character's name mean to them?